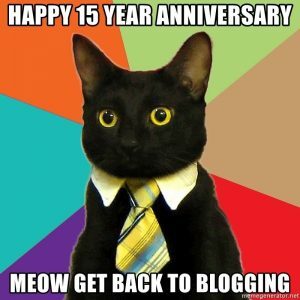 This month marks the 15 year anniversary of Saleslogix (now Infor CRM) related blogging from Customer FX!! Since the beginning of this blog in 2003, Customer FX has published over 3,000 Saleslogix (Infor CRM) articles! Wow, that’s a lot of blogging! So, to all those who have been following our content for all these years, thanks for sticking around and being part of the conversation with us! Here’s to 15+ more! I enjoy reading your blogs with great pleasure. With impatience I will wait for new interesting blogs.